Hey there! My name is Nick Faria, and I am a sophomore Journalism major for East Providence, Rhode Island. Ever since I was little, I've always been taught to chase my dreams, no matter how difficult they seemed. My biggest dream in life is to be the best sports broadcaster in the country. My first year here at Hofstra was everything I could have dreamed of and more, as it prepared me for that next step into becoming the best. When the school year ended, I had a choice. I could go home for the summer, maybe get a job and relax - or I could work on campus and broadcast games over the summer for our radio station, WRHU - Radio Hofstra University. I chose to stay here in New York and pursue my dreams. In the beginning of the summer, I was working some music slots and would do tasks that I did during the normal school year. It wasn't until a little later on that I was beginning to get chances that most freshmen entering their sophomore year never get. Fellow WRHU students and myself at the Stakes. 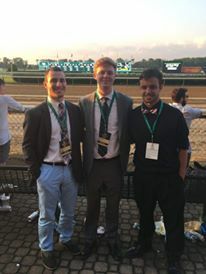 I was a field reporter for WRHU during the Belmont Stakes, and I had the opportunity to interview the winner of the Saratoga race, as well! 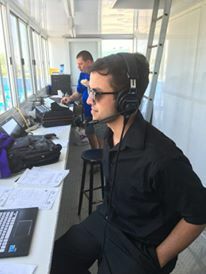 I also covered Long Island Ducks baseball games and at one point was a solo broadcaster for the New York Lizzards, a Major League Lacrosse team. I was also on hand to watch two MLL seasonal and game records fall within the same game! I was recently selected to cover a hockey event for the radio station, as well as a local newspaper! This summer has taught me a lot about myself, as well as sports I normally wouldn't think to cover, like horse racing. I'm so glad I made the choice to stay here over the summer because it really helped me to be one step closer to reaching my goal. 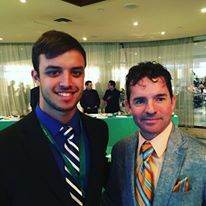 Saratoga winner, Kent Desormeaux, and I.